Did you know NITECORE has EDC options to fit any style or budget? 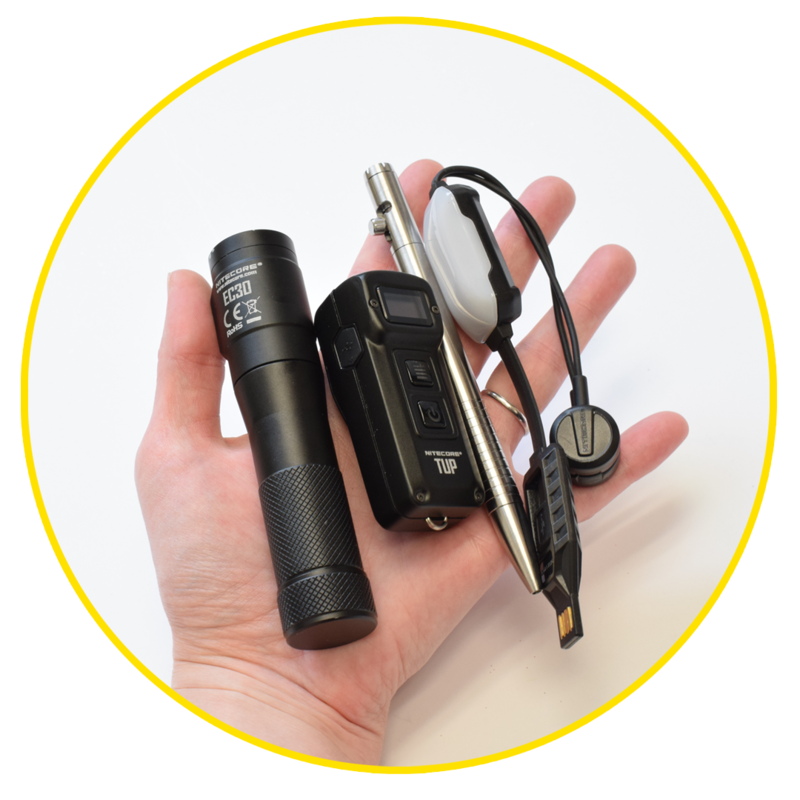 In today’s blog we put together 3 different everyday carry builds to show you just some of the possibilities that exist using NITECORE flashlights and accessories to get you inspired. The first set up we have is designed for the outdoor adventurers out there. Although we have plenty of pocket carry options that would be great for camping, we built this carry with the idea that you’ll probably have a bag or backpack for your gear. If you’re going to be camping and exploring in the dark, you’ll need a powerful flashlight that can pull double duty so for this EDC we picked the NITECORE LR12 2-in-1 flashlight and lantern. 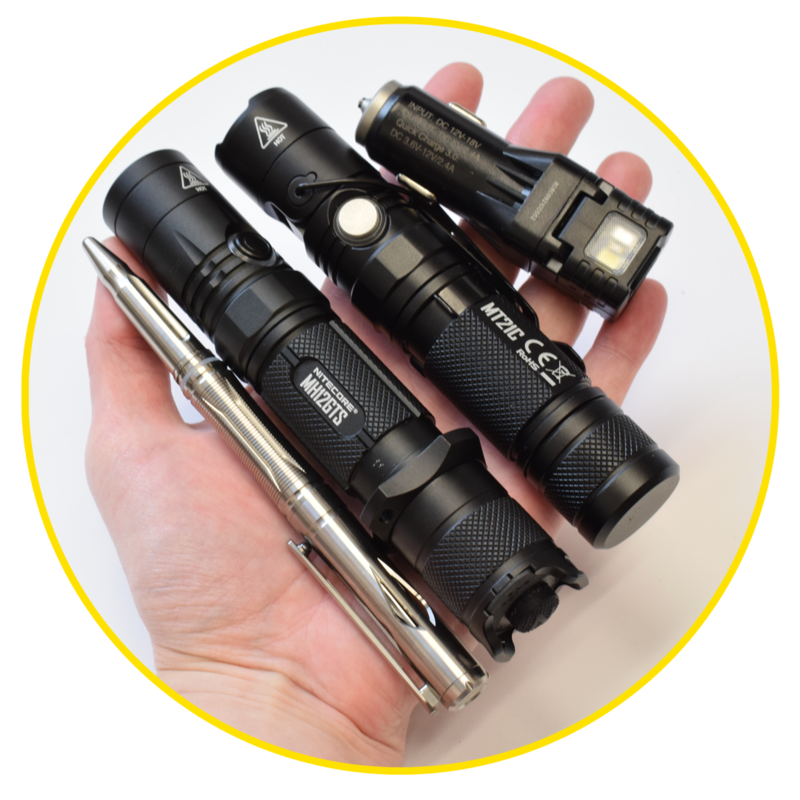 Although there are a lot of NITECORE flashlights you might consider, we picked the LR12 for this collection because of the bright, 1000 lumen output and functionality that cannot be beat. Not only can you use this like a traditional flashlight, but with a quick twist, the LR12 turns into a mini lantern for tent and campsite illumination. There’s also a magnetic base and lanyard so you have more hands-free options. To keep your LR12 charged, we like the NITECORE F2 flexible charger which can be used with any USB power source like power banks and solar panels to charge your 18650 batteries. You can also use charged batteries with the F2 as a power bank itself to charge your other USB devices. Finally we round out this carry with the NITECORE NTP21 tactical pen which is ideal for taking field notes as well as a backup glass breaking tool in emergencies. Made from aluminum, the NTP21 is durable for everyday use but won’t add unnecessary weight to your carry. Our next EDC setup is built for office and IT professionals and designed to be able to be carried in a single pocket. Much like our outdoor build, there are a couple different options for EDC flashlights that would all be great choices here. However, we narrowed the choices down to our two favorites. 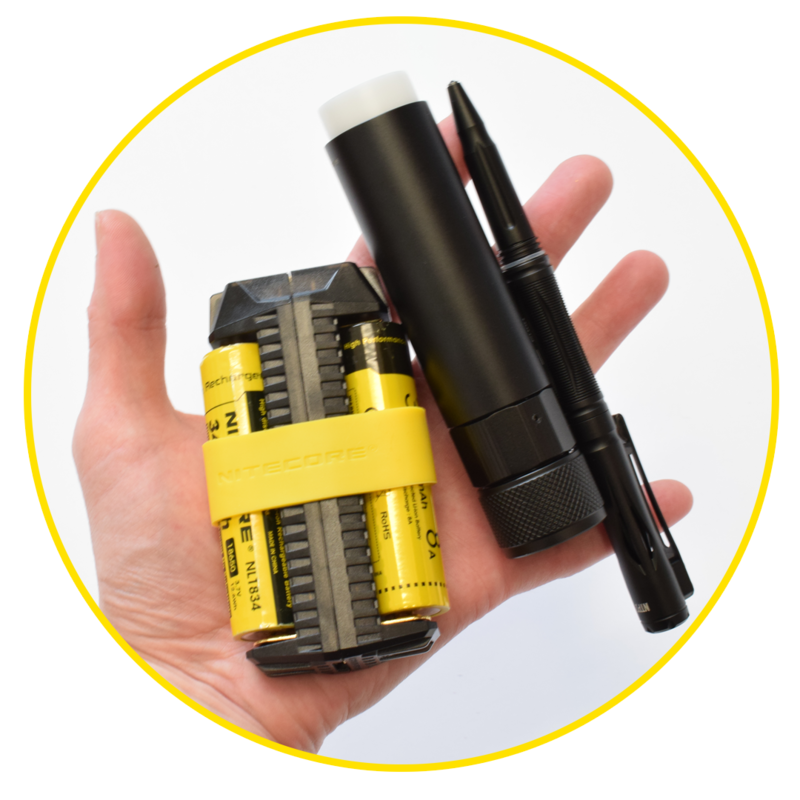 Our top choice is NITECORE TUP because you simply can’t beat the 1000 lumen output, ultra compact body and simple to use interface. The TUP also has a built-in USB charging port making it easy to recharge as needed. If the TUP isn’t quite your thing or you need something even brighter, you could also carry the NITECORE EC30 which is a sleek and distinguished EDC flashlight that emits a powerful 1800 lumen output. If you do carry the EC30, we highly suggest adding the LC10 charger to your carry. This magnetic USB charger condenses down easy for pocket carry and will let you charge any of your li-ion or IMR batteries. You can also pair the LC10 with a fully charged battery to charge other USB devices such as your phone if you’re caught in the field away from power. Last, but not least, this EDC setup includes the NITECORE NTP30 titanium bolt-action pen. The streamlined titanium body on the NTP30 makes a bold statement and adds style to your carry while keeping your prepared for note taking, signing documents and the myriad of other doodles and scribbles throughout your day. The bolt-action means you won’t have to keep track of a pen cap, and high quality German ink refills let you reuse the NTP30 over and over again. Tradesmen, construction workers, maintenance men and anyone who works with their hands will find this final EDC set up particularly useful. Once again, we’re giving you two of our top picks for everyday carry flashlights for this setup. First we have the NITECORE MT21C which has a 90 degree adjustable angle head and magnetic base, making this one of our absolute favorite flashlights for anyone who needs to do work in the dark. For a more traditional flashlight, our second pick is the NITECORE MH12GTS which features a powerful, 1800 lumen bright TURBO mode and built-in USB charging. The slim, 1” body is one of our most popular styles and can easily be carried in pockets or with the included holster. If your day involves any travel time in a truck or car, you’ll definitely appreciate the NITECORE VCL10 QuickCharge 3.0 car adapter and flashlight. Not only will this adapter let you quickly charge all your USB devices, but it also includes a backup white and red flashlight and emergency signal. The magnetic body of the VCL10 can be stuck to the side of your vehicle and a photo sensor will automatically make the VCL10 red light blink faster when it detects oncoming traffic. Rounding out our tradesman EDC build is the NITECORE NTP20. This titanium version of NTP21 we included in our outdoor EDC and has all the same features while adding even more durability thanks to titanium body. For those of you who work as hard as you play, you’ll appreciate the difference. Love my nitecore EA41 flashlight! NITECORE IS THE BEST!